"From "the most powerful psychiatrist in America" (New York Times) and "the man who wrote the book on mental illness" (Wired), a deeply fascinating and urgently important critique of the widespread medicalization of normality. Anyone living a full, rich life experiences ups and downs, stresses, disappointments, sorrows, and setbacks. These challenges are a normal part of being human, and they should not be treated as psychiatric disease. However, today millions of people who are really no more than "worried well" are being diagnosed as having a mental disorder and are receiving unnecessary treatment. 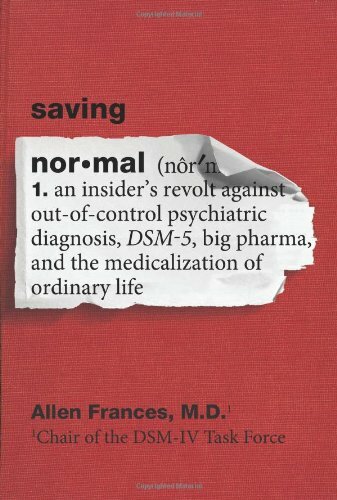 In Saving Normal, Allen Frances, one of the world's most influential psychiatrists, warns that mislabeling everyday problems as mental illness has shocking implications for individuals and society: stigmatizing a healthy person as mentally ill leads to unnecessary, harmful medications, the narrowing of horizons, misallocation of medical resources, and draining of the budgets of families and the nation. We also shift responsibility for our mental well-being away from our own naturally resilient and self-healing brains, which have kept us sane for hundreds of thousands of years, and into the hands of "Big Pharma," who are reaping multi-billion-dollar profits. Frances cautions that the new edition of the "bible of psychiatry," the Diagnostic and Statistical Manual of Mental Disorders-5 (DSM-5), will turn our current diagnostic inflation into hyperinflation by converting millions of "normal" people into "mental patients." Alarmingly, in DSM-5, normal grief will become "Major Depressive Disorder"; the forgetting seen in old age is "Mild Neurocognitive Disorder"; temper tantrums are "Disruptive Mood Dysregulation Disorder"; worrying about a medical illness is "Somatic Symptom Disorder"; gluttony is "Binge Eating Disorder"; and most of us will qualify for adult "Attention Deficit Disorder." What's more, all of these newly invented conditions will worsen the cruel paradox of the mental health industry: those who desperately need psychiatric help are left shamefully neglected, while the "worried well" are given the bulk of the treatment, often at their own detriment. Masterfully charting the history of psychiatric fads throughout history, Frances argues that whenever we arbitrarily label another aspect of the human condition a "disease," we further chip away at our human adaptability and diversity, dulling the full palette of what is normal and losing something fundamental of ourselves in the process. Saving Normal is a call to all of us to reclaim the full measure of our humanity." First of all I think what this book has to say is very important, but I do not believe it says it in the best way. The issues at hand are ones that the author is both extremely knowledgeable and passionate about. My problem is that the strident didactic voice is overbearing and off-putting, even when I believe in the dangers of over medication and over diagnosis (or misdiagnosis) . These are issues that have concerned me since I was young (perhaps a side effect of reading enough at a distinctly young age to be aware of treatment abuse?). Doctor Frances is not at any point suggesting that psychiatric treatment and medication are never needed, he in fact is arguing just the opposite. His argument is that diagnostic inflation hurts both the healthy and those who actually suffer from psychiatric disorders. Sometimes a 'disorder' is actually a normal part of life, be it energetic children, or grieving after a loss, or other. A misdiagnosis or over diagnosis can sentence someone to unnecessary medication that they believe is needed and that risks extremely disruptive side effects to end, not to mention the discrimination and stigma often attached to psychiatric disorders. On the flip side this adds to the view of psychiatric disorders as "not such a big deal" and takes away from resources for those who actually need them from those who just told they need them when maybe their needs are for a different type of treatment and care (such as natural child exuberance vs ADHD). I could be too harsh in criticizing Dr. Frances for how he comes across, the previous paragraph proved challenging in the attempt to write in a neutral fashion that does not imply people with disorders are faking, and that those who are over diagnosed are maliciously faking. That doesn't invalidate my criticism of his writing, and in fact he admits that his words have been misused and twisted by other groups to support tearing down all psychiatric treatments and denying the existence of psychiatric disorders. Before reading Saving normal you have to understand the purpose of the book. Do not skip over the introduction, read the cover flaps. Then when you read the book make sure to finish the sections (I'd recommend finishing the whole book, but I have no control over your actions. There were several points where I would start a new section and be taken aback by something, until I read further into clarification and explanation. I do recommend reading Saving normal, but caution the reader to let the full arguments be revealed before making decisions on what Dr. Frances has to say.